Andrew Brackfield: Education is very important and you can never be sure of leaving your children any worldly goods, but at least you can be sure that once you've given them a good education that's something that no one can ever take away. 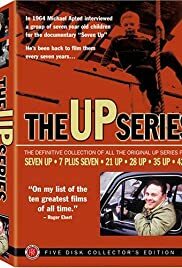 Here, the Up series began in earnest. "Seven Up!" and "7 plus Seven" were shorter, and the interviewees, naturally, didn't have much of interest to say. Listening to what silly things cute children have to say doesn't make for a very serious or interesting documentary. The interviews at 14 weren't of much initial value, either, especially with the shyness of two of the participants. Yet, I did enjoy listening to and contrasting the political ideals of young socialist Bruce and conservative John, as well as contrasting their manners. The first two segments do gain importance and value, though, with this and the following installments, as parts of them are intercalated with the new interviews. It's not even necessary to see previous Ups, as a result; each of the latter documentaries stands well on its own. At twenty-one, the subjects are now young adults and are naturally more insightful, reflective and, importantly, more articulate. Here, as well, Neil had taken shape as the most compelling figure in the series; he is now melancholic, nervous and poor. And, in this episode, he is bitter when discussing his parents and upbringing. With the other participants, I saw confidence and contentment, especially compared to when they were teenagers, even if they were uncertain of their futures--or chain smoking. What Michael Apted and the filmmakers did with the film that I especially liked was that they brought the gang together to watch the previous two films and caught their reactions to the films and asked them their thoughts on the series. Generally, it seems, they don't see the importance or purpose of the series; perhaps, they even see it as somewhat of an intrusion. I suppose I wouldn't see the purpose or significance of the first two films, either, without having seen "21" and the subsequent films that aggrandize upon their beginnings; it's the subsequent films that give the previous ones significance. As far removed or alienated as one seems at twenty-one from his seven-year-old self, the Jesuit proverb still holds truth, as Apted discovers. Early in the film, Neil says that by bringing the group together, the filmmakers might be defeating their original purpose of examining class, or socioeconomic, barriers. And, that focus does seem to be forgotten at times in this addition, although, I suspect, for different reasons. Not only has the series taken on more significance than its initial intent, but also, the interviewees are now more concerned with themselves; even on their pasts, there is more reflection and insight. They're looking inward, planning and thinking about their futures and thus looking forward.